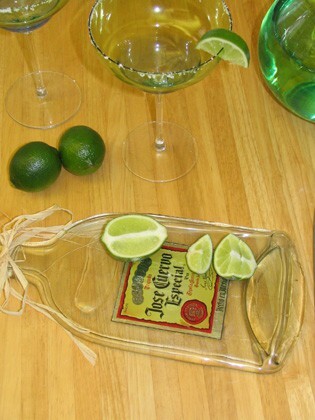 How to flatten bottles make cutting boards or small serving trays, awesome! How to flatten bottles and make cutting boards or small serving trays, awesome! 1. Make sure the toaster oven is on a surface where the sides are not touching anything else. 2Sprinkle a little bit of salt on the tray to hold the bottle in place and then place the bottle with the label up on the tray.3Close the toaster oven and set the temperature for 200 degrees. Wait for two hours.4After two hours have passed, turn the temperature up as high as it will go (but do not set to broil). Leave the bottle cooking for about 10-15 hours.5After 15 hours, the bottle should be completely flat.6Turn the temperature down to 200 degrees. Leave the bottle in the oven for 15 hours.7Turn the toaster off, and leave the bottle in the toaster for about 5 more hours.8Take out your flattened bottle, and put it somewhere to display! !9This will NOT work! See “discuss” tab above for details.